Released on November 9th 1984, Solid became a UK one hit wonder, reaching #3 on 10th February 1985 for two weeks and became the 16th best-selling single of 1985. The title track and lead single from the album was penned by husband and wife team Nickolas Ashford and Valerie Simpson, and was shortened to under four minutes for the radio edit - the full version lasted for 5 minutes and 12 seconds to be precise. The B-side featured a dub version. I remember this track playing regularly on the radio at work, and lads being lads, we decided to come up with a dirty version of the song with the chorus "Solid as my ..." Well, you can guess the rest! Ah, what I'd give to be a daft, carefree teenager again. The real lyrics referred to the duo's strong relationship and describes their love for each other as being "solid as a rock". It really was a song for the ladies, which is why, no doubt, many teenage lads came up with an alternative version just to annoy them. Solid peaked at #12 on the Billboard Hot 100 in the U.S. and topped the R&B chart. The single was also a major hit across Europe, reaching #2 in Germany, #3 in Holland and Switzerland and #4 in Austria. The song also topped the music charts in New Zealand. 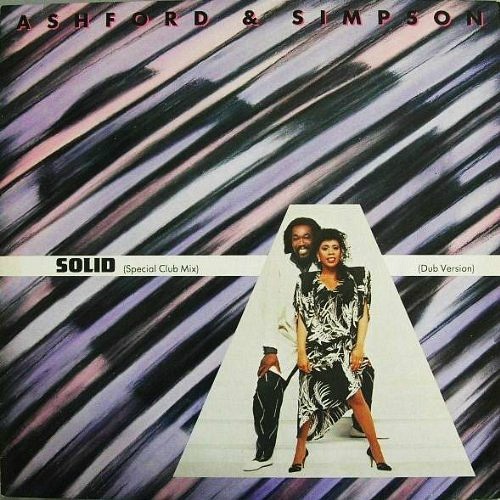 The only other songs by Ashford & Simpson to chart in the UK were It Seems To Hang On (#48) in 1978, Babies (#56) in 1985 and Count Your Blessings (#79) in 1986.